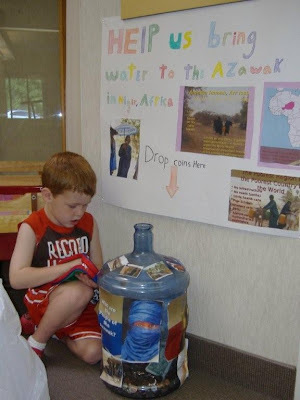 In May, 2008, students in Maryland (read the story and see pictures here) and students in Ohio each sponsored A Walk For Water, altogether raising close to $20,000. These much needed funds will go toward Amman Imman's next borehole, bringing another source of sustainable water to the Azawak. Our adolescent students initiated the idea of a whole-school sponsored walk. 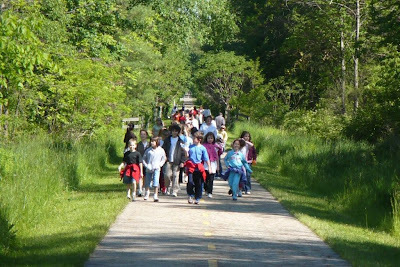 They walked ten miles, while our Upper Elementary students walked six miles and the Early Elementary walked three miles. Some early elementary children took turns hauling a large container of drinking water which was as much symbolic as it was necessary to hydrate at the end of their walk. The primary students walked the perimeter of the school and collected coins in a large water bottle in our foyer while a smaller group spontaneously began a secondary collection in their classroom. The Young Child Community (14 through 30 months of age) undertook a long walk across our eleven acres to the pond where they celebrated with a drink of fresh water upon successfully arriving there! The whole school community raised a total of $6,351. I found that your student’s presentation made quite an impression on our children as they were still contemplating solutions for a long time after the initial presentation. The children’s empathy was further realized as they shared reflections about their physical experience, and discovered that it was just a small part of the work of the children of the Azawak during the driest season. I was personally amazed by the success of the funds raised by the children and staff and their determination to accomplish a mission through the successful coordination of 240 students, parent volunteers and staff. Having two separated campuses serving separate ages, has motivated us to work more intentionally toward developing a “whole school Hershey Montessori community”. Coming together to work toward a common goal, in service to others, was a wonderful way to experience the power of individuals when they can collaborate in a united spirit as a “whole” community. At the end of the year, the whole-school met to reflect on the year and to plan next year’s work. The staff unanimously proposed that we continue this relationship to Amman Imman and that we can continue to integrate water quality issues into our Montessori work next year. Faculty suggested that perhaps the adolescents could take up the work from your students and continue on the road to other schools and thus continue to tell the story. Thus this relay of information can continue on its odyssey by Montessori children and extend it beyond the International Montessori web that you began. in Washington DC and in New Hampshire. Stay tuned for details as plans take shape. I think it is wonderful on how you icorporated the children into such a large project. This is such a great experience and leswson for our young.